The lightning strike provided the spark. Running a modest sailboat charter out of Montauk with his wife Amelia, David Ryan began to realize the market called for a larger vessel. His boat could carry six passengers and he was turning business away when disaster hit . . . in the form of a lightning strike that destroyed the Ryans’ Catalina 38 sailboat. The crisis forced David’s hand and his new craft, the charter catamaran Mon Tiki is slated to launch this month. The vessel’s name pays homage to Thor Heyerdahl’s famous voyage from South America to Polynesia aboard a hand-hewn balsawood raft christened the Kon Tiki. Inspired by traditional Polynesian double-canoe designs, Mon Tiki is the East End’s first fully Coast Guard certified charter catamaran. Mon Tiki’s not just fully certified; it’s also fully built on the East End. 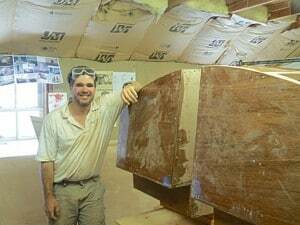 Ryan, who’s been building boats for 15 years, embarked on the ambitious project, using skills he already had, plus adding new ones to complete his craft. A modular design allowed Ryan to work in a smaller space than he would have needed to accommodate the full catamaran – Mon Tiki’s two hulls have crossbeams that set into pockets and can be removed. Working with an experienced project engineer, Ryan figured out how to build a catamaran that would conform to Coast Guard standards. On a weekly basis, USCG inspectors visited the shop, scrutinizing the catamaran throughout the building process. Measuring 38 feet long by 21 feet wide, Mon Tiki will be certified to carry up to 30 passengers, boasting the highest standard of safety designated by the USCG Marine Safety Center in Washington, DC. Three hundred square feet of decking will accommodate seafarers looking to enjoy a sail on a catamaran that blends old and new innovations. Special roping is used to reflect ancient building techniques while modern materials, like Lloyds of London certified plywood boasts skinned fiberglass epoxy. Last week Mon Tiki’s hulls were transported to the Montauk Marine Basin for final assembly. The captain, and builder, hopes to launch within the next two weeks. Ryan, whose company is called Sailing Montauk, plans to offer a variety of trips including sunset sails and discover Montauk trips. Private charters for corporate outings, celebrations, family groups and more will be available. Off-season, Mon Tiki could serve as a floating classroom for student groups. With a final push in full effect this week, Ryan seemed a little breathless. Myriad punch list details remained and, with the East End lacking a sailboat building industry, he said, “It’s all on me now.” This month, when Mon Tiki takes its maiden voyage, the success and pride will be all on him as well. PreviousPrevious post:Giving MON TIKI Her Mahogany Decks!NextNext post:MON TIKI comes to Montauk!